15 Million Tons of Carbon Dioxide Emitted Each Year On Residential Outdoor Lighting in the U.S.
Home » Uncategorized » 15 Million Tons of Carbon Dioxide Emitted Each Year On Residential Outdoor Lighting in the U.S. Lighting that emits too much light or shines when and where it’s not needed is wasteful. Wasting energy has huge economic and environmental consequences. Most outdoor lighting in the U.S. is used to illuminate streets and parking lots. The amount of energy used for lighting outdoor spaces is enough energy to meet New York City’s total electricity needs for two years! IDA estimates that least 30 percent of all outdoor lighting in the U.S. alone is wasted, mostly by lights that aren’t shielded. That adds up to $3.3 billion and the release of 21 million tons of carbon dioxide per year! 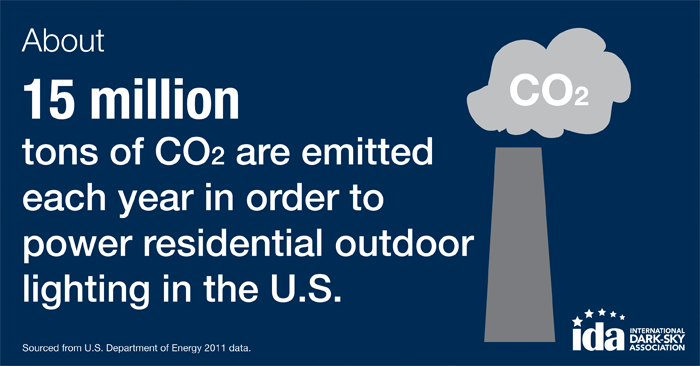 15 million tons of carbon dioxide emitted each year is from residential outdoor lighting alone. To offset all that carbon dioxide, we’d have to plant 875 million trees annually. Installing quality outdoor lighting could cut energy use by 60–70 percent, save billions of dollars and cut carbon emissions. Outdoor lighting should be fully shielded and direct light down where it is needed, not into the sky. Fully shielded fixtures can provide the same level of illumination on the ground as unshielded ones, but with less energy and cost. Unnecessary indoor lighting – particularly in empty office buildings at night – should be turned off. LEDs and compact fluorescents (CFLs) can help reduce energy use and protect the environment, but only warm-white bulbs should be used. Learn more about LEDs and color temperature from our LED Practical Guide. Dimmers, motion sensors and timers can help to reduce average illumination levels and save even more energy. Quality lighting design reduces energy use and therefore energy dependence. It also reduces carbon emissions, saves money and allows us to enjoy the night sky. Watch a clip of the documentary The City Dark to learn how lighting design can reduce light pollution and also conserve energy. Next post: Why is Blue Light at Night Bad?